Ernst's Economy for you: Is the fairytale of unlimited profits in the telecom business finally over? Why investors in Dutch telecom behemoth KPN should consider selling their stock to América Móvil! Is the fairytale of unlimited profits in the telecom business finally over? Why investors in Dutch telecom behemoth KPN should consider selling their stock to América Móvil! The Dutch telecom behemoth KPN is currently under the spell of América Móvil (AM), the Mexican telecom company owned by the world’s richest man, Carlos Slim. A few weeks ago the news became known that Slim showed interest in collecting a decisive minority share of 28% in KPN for a price of €8 per share. The former Dutch state monopolist that is currently going through a difficult time on the Dutch and European cellphone and mobile internet market, was not amused and stated that the offered price was much too low. Shareholders of AM on the other hand found that the offered price was too high and punished AM with a substantial drop in market value. Carlos Slim, the extremely wealthy owner of Mexican-based telecom giant América Móvil (AM), is a smart man. He tries to get the keys of the vulnerable Dutch telecom company KPN at a bargain price. KPN has a new board of directors and is weakened by a series of profit warnings. With a targeted stake of 28% of outstanding KPN stock, Slim remains under the magical limit of 30%, avoiding the obligation of bringing out an offer on all remaining shares KPN. This saves him €8.2 bln in take-over expenses, but offers in fact the same result: he gets control over KPN. When this tactic succeeds, the Mexicans of América Móvil book two results at the same time. AM has built up a stake of 4.1% in KPN stock. At the moment that this stake passes the 5% threshold, the Dutch Authority Financial Markets is forced to publish the news on this stake, making the Mexican interest in KPN public information. Normally this would have led to soaring stock rates for KPN. By offering a partial offer of €8 for a 28% stake, the Mexicans prevent the emergence of fantasy prices in KPN stock. Even more important is that AM with a 28% stake in KPN keeps potential competitors out of the way and gains almost total control in KPN. The reason is that shareholders’ meetings in The Netherlands seldomly attract more than 50% of all shareholders. If the presence at the shareholders' meeting is less than 56% of all shareholders, AM decides with 28% of all shares in fact what happens with KPN in the future. The supervisory board of KPN stated today that the offer of AM is ‘undesired’. The stock of América Móvil, the company that announced on Tuesday, May 8, it wanted to purchase a large stake in KPN, dropped dramatically this Tuesday. Investors devaluated the share by 8% at the Mexican stock exchange. ‘We find this offer in KPN not very cheap for a non-controlling stake in a company whose ebitda-profit and net profit in 2012 might drop by 5.9% and 6.2%, according to our forecasts’, according to Valder Nogueira, Head of Stock Research at Banco Santander in Brazil. ‘We think that the market will take some profits after recent good news in a mixed reaction at a transaction that is not particularly cheap. Today, Tuesday May 29, América Móvil confirmed their offer of €8 by launching it officially and irrevocably, although it was called ‘substantially too low’ by the KPN management. Between May, 30 and June, 27, shareholders of KPN can offer their shares at the offered price until a stake of 27.7% is reached. This is a peculiar situation: the KPN management thinks that the offer was too low, while AM shareholders considered the offer to be too high. Who is right?! 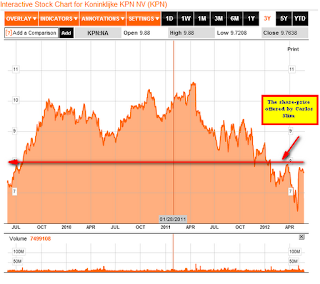 Normally, if you looked at the KPN stock rates during the last three years, the €8 offer seems indeed very low. During the vast majority of the last three years, the KPN stock has been well above the €8 threshold. KPN has been a company that offered very solid profit and still possesses stakes in a few important European telecom companies, like E-Plus in Germany and BASE in Belgium. And from a technological point of view, KPN is a modern telco. The catch, however, for KPN is the development of the international telecom market. While the importance of fixed telephony had already been shrinking for a number of years in a row, it seemed that the cellphone market was the goose with the golden eggs in The Netherlands and beyond. This changed, however, with the explosive emergence of the smartphone in Europe and the comeuppance of a number of (almost) free apps, limiting strongly the profitability of mobile telecommunication: Skype, Ping, Whatsapp and other free apps enabling telephone traffic and instant messaging over the internet. Attempts of KPN and two of its main competitors/colleagues T-Mobile and Vodafone to silently pinch off certain internet services hit a wall of protest and eventually legislation. According to the new Dutch legislation, the internet should be fully accessible from a smartphone. On top of that, the “coincidential”, almost simultaneous price-raises of KPN, Vodafone and T-Mobile within two weeks raised eyebrows at the OPTA, the supervisory body for the Dutch telecom market, who started an investigation concerning this topic. In my opinion fixed internet and mobile internet will become normal utilities in the near future, just like electricity is a normal utility. You don’t think about it, you don’t compare it often with the offers of other providers (maybe only once a year when the contract expires)… It just needs to be there, when you plug it in; at the highest quality and against the lowest possible price. I think this business model will disappear to be replaced with a business model that treats fixed and mobile internet as a utility. The customer buys a phone and pays a very limited fee per month for internet bandwidth. All ´classic´ telephone actions (calling, SMS-ing) will go via IP connections, as there is no need anymore to use the classic digital voice or data connections. Based on this opinion that I still endorse completely, it would be a smart move of the Dutch shareholders of KPN to take the money of América Móvil and run… KPN has been and still is a very good company, that will present its shareholders with decent profits in the future and will remain a leader in innovation in my opinion. However, I strongly doubt that this company will be the money machine with the excess profits it had been before. The same is true for its main competitors in The Netherlands and abroad: T-Mobile, Vodafone, Téléfonica and others. A further concentration of power in telecom land, in order to save costs, will IMO lead to an intervention from the European Commisioner for Internal Competition: the emerging party after such a merger would become too powerful on a European scale. From my ‘mobile internet as a future commodity’- doctrine, it is doubtful that European telecom providers can keep prices for mobile internet as high as today, unless they break every rule concerning a level playing field, by making illegal price agreements and dividing the telecom market between themselves. If the prices for mobile internet will remain too high, powerful competitors from the America’s, Asia and perhaps even Africa will emerge eventually. One other unique selling point of the current telco’s – the exclusive sales of Apple iPhones in certain countries– will lose its attraction in the near future. The power of the Apple-brand is still strong today, but it will become more and more normal and people won’t be willing anymore to pay €600 plus for an Apple telephone with an exclusive, expensive subscription. When you look at KPN with these assumptions in mind, €8 suddenly seems a fair offer. Of course this article reflects my opinion and is not meant as an investment advice. Just to let you know! Is the future of aviation… the highspeed train?